Choose 2 champions and start the adventure! Battle in the arena to climb the ranks, purchase upgrades at the armor and pet shops, and sift through the chaos to discover the emperor's spy! Battle is turn-based, so take your time. 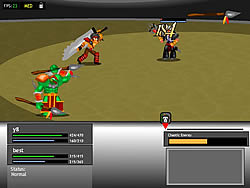 Use the menu options in the middle of the screen to pick your move, then click your target. Take your opponents down before your champion's health drops to 0. Take home the win!